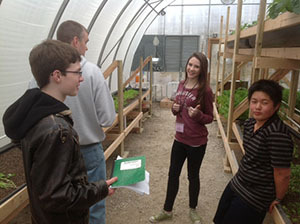 And brand new this year is their Greenhouse Project, which introduces aquaponics and business principles to their students. This will help students learn how to run a business and serve as a means to provide healthy, affordable food for their community. The construction of this project began last fall and is blooming just in time for spring. 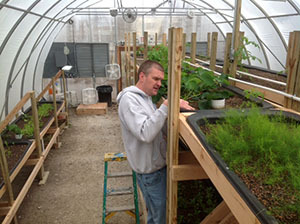 Aquaponics, as described by UVM, is a sustainable gardening system that combines aquaculture (raising aquatic animals like fish) with hydroponics (cultivating plants in water) to create a symbiotic (mutually beneficial) environment. Imagine this: they have two large tanks of fish. 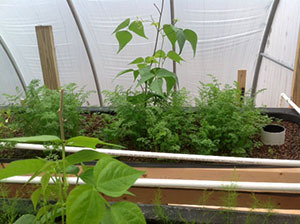 The fish’s waste, full of nutrients for growing plants, is pumped through beds of growing plants. The rocks filter the nutrients out of the water, where the roots absorb them. The water then goes back into the fish tanks, giving them fresh, clean water. This system is ideal for everyone involved! There are no chemicals or additives used and it is basically maintenance free. Perfect for youth just learning how to grow and create their own business. Matthews realizes that this is so much more than just a “fun” opportunity for the kids. “I don’t just want them to come to hang out with me; I want them to come to learn how to run a business. I want them to be learning the side of ‘I have to take steps, I have to do things to make things happen in the business world’,” he explained. And he takes every step along the way seriously. They are required fill out an application as though it were a real job. “I’m very strict on that. I’m not going out and reminding them to fill them out because that’s not real life,” he explained. For many kids, this provides a once in a lifetime opportunity. “They don’t get to interact a lot with people who run businesses. So being able to learn some different business skills will hopefully give them a desire to learn more and see that education matters more, and give them a viewpoint of ‘wow, I think I can run my own business and do this – whatever that may be’,” Matthews said. “I want the kids to see how to do that and in a community-friendly way. How can I do something that serves my community and creates jobs for my community at the same time?” he continued. “We’re also going to sell to the community that’s involved in Urban Vision. I already have parents and kids saying ‘I want this’ or ‘I want that’,” Matthews said. “From there then we can look at different options like, do we want to put up a vegetable stand out front that we sell on Saturdays, or do we want to go talk to some different restaurants or business connections? Or do we go to a grocery store and sell our product? Those are the things that I could answer, but don’t want to until the kids are doing it with me. It’s all about them learning and having those ideas. I don’t want to feed them the ideas. I want them to feel they came up with those ideas,” Matthews explained. The kids are currently in the process of just learning to grow and maintain the system. “Then we’re going to sit down as a company to discuss the different outlets,” Matthews said. As you can see, they are only getting started! This is just the first phase of what they hope this greenhouse facility and business will become. “We have a school now. There’s a lot going on! You would see a total transformation since we first started. We’re doing a whole lot more now than we were then. We have waiting lists for our after school program, waiting list for our school. There’s tons of stuff going on,” Matthews said. “And now over half of our participants are refugees,’ he continued. If you would like to get involved with this ministry that is growing, there are plenty of volunteer opportunities! 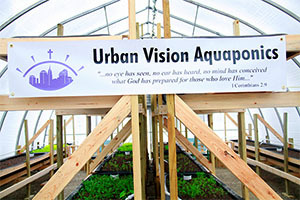 Find out more at http://www.urbanvisionministry.org To find out more about the Aquaponics programs, contact Paul Myers – pjmyers@sbcglobal.net. 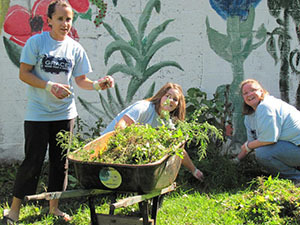 This entry was posted in Neighborhoods, Sustainability and tagged Aquaponics, Business, Education, Fish, Food, Plant, Rodney Matthews, Urban Vision, Urban Vision Ministry, UVM. Bookmark the permalink.